Hundreds of thousands of people were displaced after Hurricane Harvey hit the coast of Texas in the end of August 2017. Many of them have started repairing their homes and fixing all the damages caused by the natural disaster. Texas Governor Greg Abbott is seeking additional $61 million federal recovery funds to assist the state’s rebuilding. Naturally, this means that construction contractors are in high demand in Texas . Search for contractors in Houston, for example, increased 10-fold from July to September 2017. Many contractors from neighboring states moved to fill in the demand for construction specialists in Texas for Harvey Recovery. While this is of great help, in some cases, so-called ‘storm chasers’ are making a bad name for out-of-state contractors who move to places hit by natural disasters. By August 29, the Texas Attorney General had received more than 550 complaints for potential fraud committed by contractors. While there is a rush to fix the damages as soon as possible, consumers should be cautious when selecting a contractor for repairing the damages on their buildings. It is important to work only with contractors who are licensed and have obtained proper bonding. This guarantees the repairs will be executed according to the agreed contract and that they can obtain quick compensation if they become the victim of fraud or negligent work. 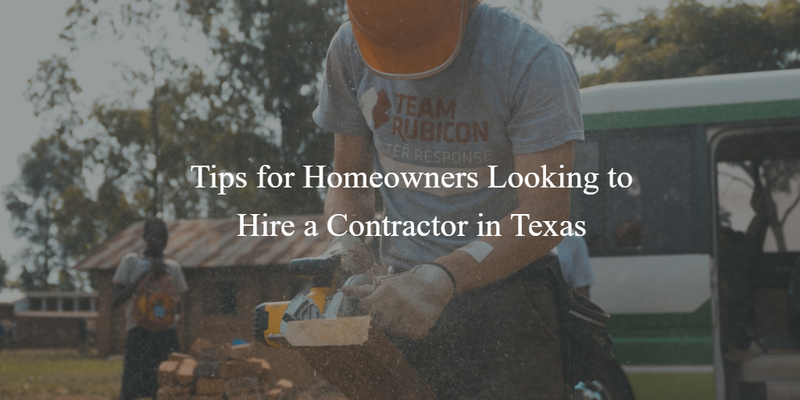 Below are some of the most important factors that Texas homeowners should keep in mind when hiring a contractor in order to avoid unpleasant situations with their post-hurricane home repairs. For hiring a contractor based in Texas, homeowners are advised to check with the specialists regarding their licensing credentials. Contractors should have a license that matches the specialty they are working in, which should be either from a local authority (depending on their requirements), or from the Texas Department of Licensing and Regulation for air conditioning and refrigeration contractors and electricians. It’s important to note that, currently, general contractors are not required to get licensed. For many, this is a big mistake on part of regulators. Many out-of-state contractors are moving to Texas to help with the massive damages. In September, twice as many people searched for options to obtain a general contractor license in Texas. Only 23.9% of them were based in Texas. About a quarter of the searches came from California, 5.7% from Florida, and 44.9% from other states. The search results show that out-of-state contractors are looking for ways to meet licensing requirements in Texas, so they can join in the rebuilding. The need for external help is also pressing, as construction companies from Texas are struggling to meet the high demand from consumers to rebuild their homes. What consumers should keep in mind is that while most contractors are ethical and will fulfill their contractual obligations, there are a few bad apples in the stack who would look to profit from the devastation. ‘Storm chasers’ are roofing contractors who are going from state to state, but not always with the best intention. In order to avoid working with scammers, homeowners should duly check the credentials of the contractor. Bonding is often an indispensable factor in the Texas contractor licensing process, set by city and county authorities. Consumers can inquire whether their chosen contractor has proper bonding as required by local bodies. They can ask about the bond number and certification of the construction specialist. After Hurricane Katrina in 2005, the Justice Department set up a task force to tackle ‘storm-chasers.’ Today the task force has already grown into the National Center for Disaster Fraud, and has worked on more than 50,000 cases of contractors’ fraud related to post-disaster rebuilding. In the week after Harvey, the Center received more than 350 fraud reports. In response to post-disaster fraud, some states have moved on to introduce stricter rules for various contractors. For example, Kentucky enacted a new piece of legislation that sanctions roofing contractors that cause extra damages on roofs they are repairing. In 2013, Kansas started requiring roofing specialists to register. In other states, legislators have tried to introduce a voluntary registration option for contractors, and Texas is one of them. However, the previewed bill has not yet been passed. While it does not occur that often, there are cases when consumers have suffered negligent work, non-completion of contracts, or fraud from the side of contractors. The strongest instrument for protecting consumers’ rights is the surety bond, which is often a licensing requirement for many types of contractors. The bond is obligatory for contractors operating in a number of Texas cities and counties but not on a statewide level. In problematic situations when a contractor has refused to complete their contractual obligations, project owners can look for a financial compensation from the surety bond that the contractor has posted during their licensing. They can file a bond claim seeking an appropriate reimbursement. Consumers can also complain to the licensing board in the respective city or state authority. If the case is proven, the affected parties will receive a proper reimbursement up to the penal sum of the contractor’s bond. What are your thoughts on the current situation in Texas? Should there be stricter regulations in place for contractors?